If you have evered ordered Churros with Chocolate Sauce from a restaurant, you have likely experienced something delicious. But just wait until you taste the home-made version! Hot, crispy and fresh out of the fryer is the best way to enjoy these babies – preferably dipped in a rich chocolate sauce. For those who’ve never tried one, a Churro is a Spanish and Mexican dessert made by deep-frying a choux-pastry dough, then rolling the hot pastry in cinnamon and sugar. Quite similar to a doughnut but crispier, and with a slightly softer texture inside. Churros are best when served immediately after frying and sugar-coating. 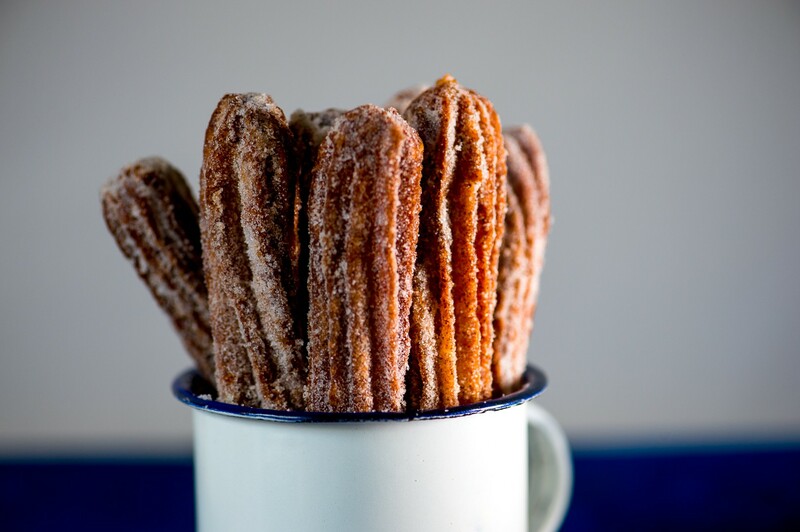 The dough itself is really easy to make and if you’re short on time, you can freeze the piped churros and just fry them whenever you’re ready to serve. I used the Russell Hobbs deep fryer which makes this part even easier! PS. Here’s another delicious deep-fried dessert! Start with the chocolate sauce. Heat the chocolate, cream and orange zest (if using) together over a pan of simmering water (or in the microwave at 20 second intervals). Stir until smooth and set aside. Mix the sugar and cinnamon together in a shallow bowl and set aside. To make the churros, place the butter and water into a saucepan over medium heat. Add salt and sugar and stir until dissolved. Bring the mixture to a boil, then remove from the heat. Stir in all the flour at once and mix until smooth. Leave the mixture to cool for 15 minutes. Beat together the eggs and vanilla. Gradually add this to the cooled flour mixture, beating until smooth. It may look curdled at times but just keep beating. Pour your oil into your Russell Hobbs deep fryer and heat to 180°C. Place the churros batter into a large piping bag fitted with a large star nozzle. Pipe lines directly into the oil, 8-10cm long, about 3 at a time – they will curl up. Use a clean pair of scissors to snip the dough away from the piping tip. Alternatively you can pipe the lines onto individual pieces of greaseproof paper and drop the paper and churros into the oil (the paper will float to the top). This results in straighter churros. 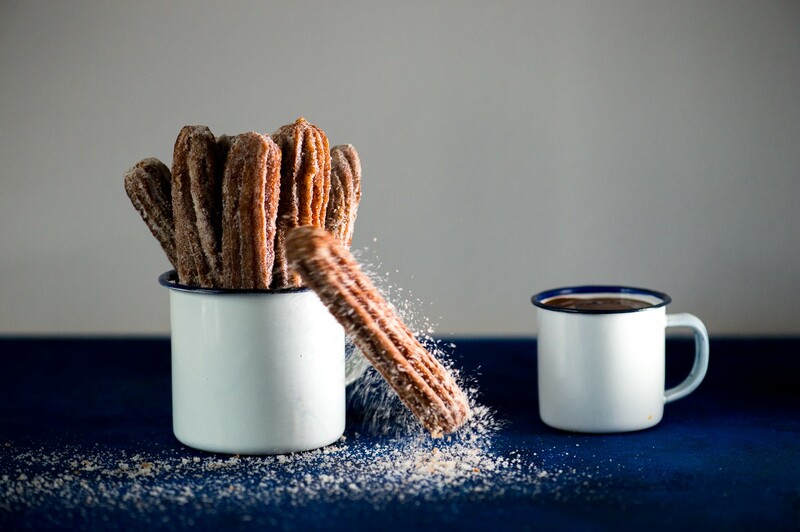 The piped churros can also be frozen on a baking tray and deep-fried directly from frozen. Cook the churros for about 1-2 minutes on each side, or until golden brown and cooked through. Remove from the oil and drain, then roll in the cinnamon-sugar coating while still warm. Repeat with the remaining batter. 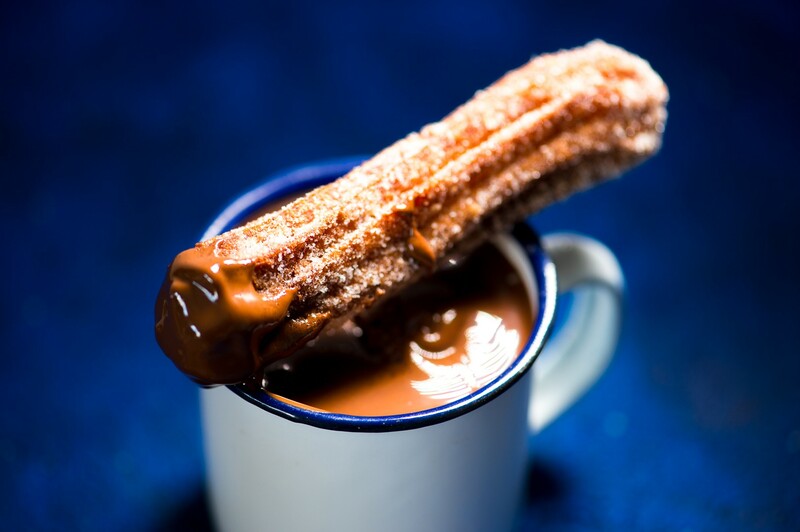 Serve the churros hot with the warmed chocolate dipping sauce. This is a very dangerous blog – for the waistline, that is! These look so delicious!